Funeralia – part of ‘the Facultatieve Group’ – is certified in accordance with DIN EN ISO 9001: 2008 and is “Made in Germany”. Funeralia is audited annually by TÜV, the independent German ‘Technische Überwachungsverein‘ under very stringent quality requirements. 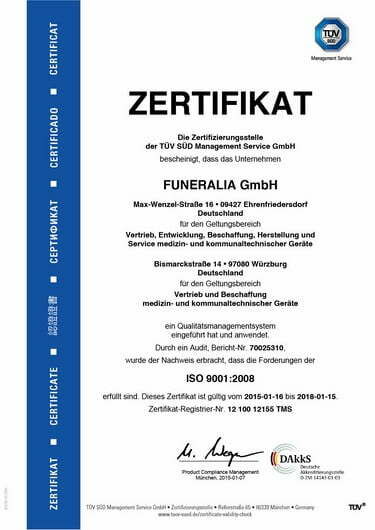 We are very proud that the TÜV has awarded Funeralia its certificate every year since 1999 based on its strict standards and extensive audit.